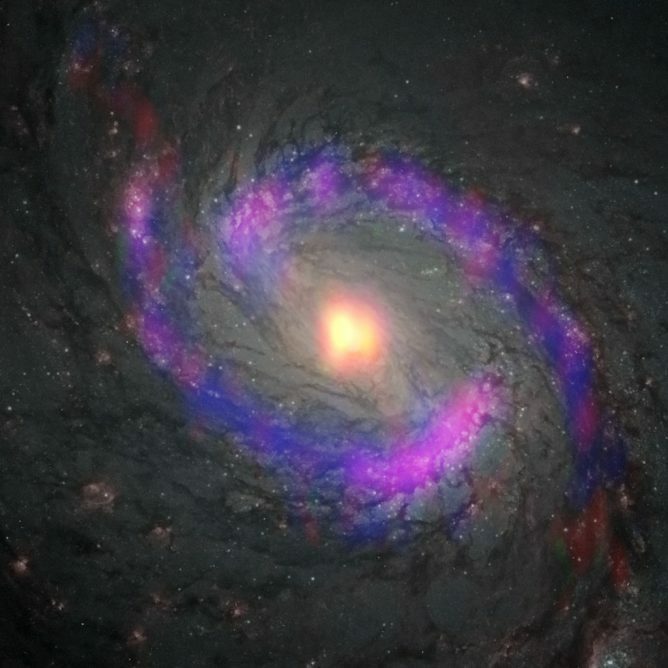 The central region of the spiral galaxy M77. The NASA/ESA Hubble Space Telescope imaged the distribution of stars. 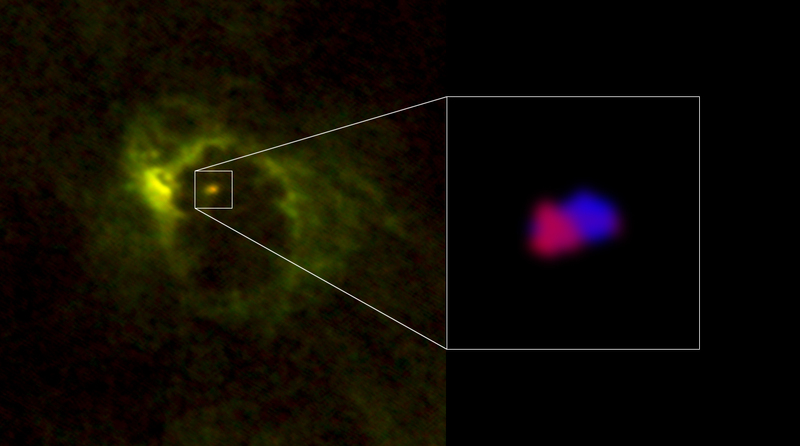 ALMA revealed the distribution of gas in the very center of the galaxy. 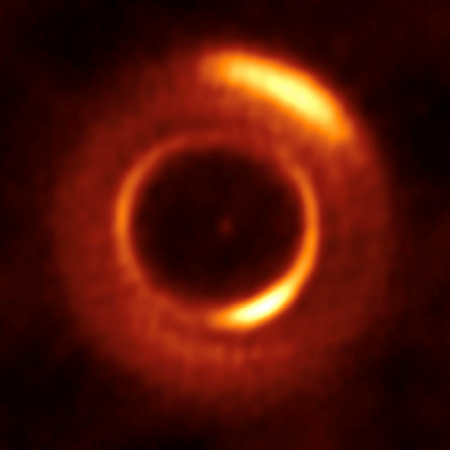 ALMA imaged a horseshoe-like structure with a radius of 700 light-years and a central compact component with a radius of 20 light-years. 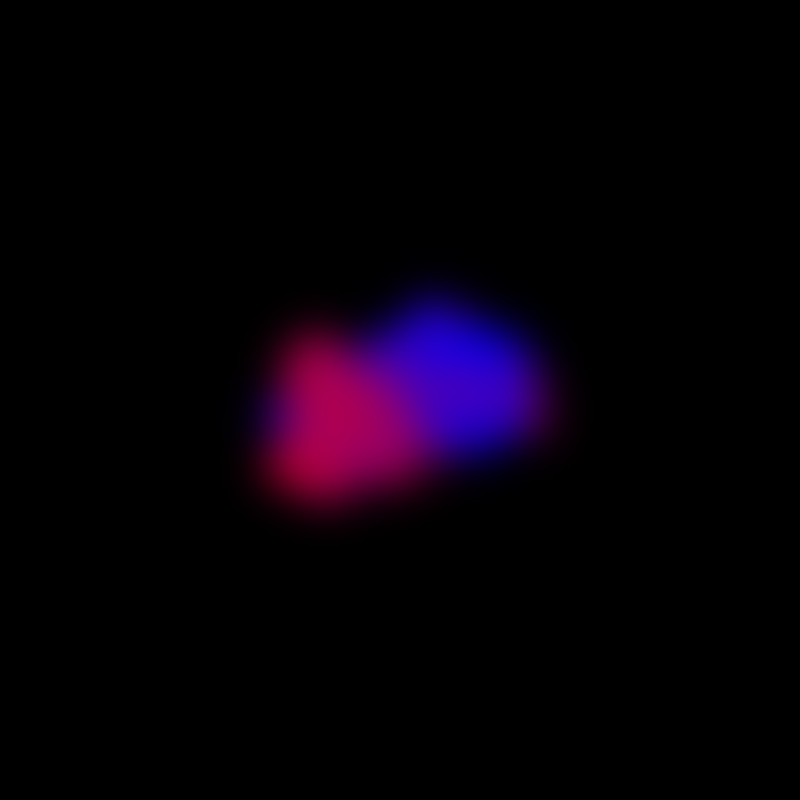 The latter is the gaseous torus around the AGN. Red indicates emission from formyl ions (HCO+) and green indicates hydrogen cyanide emission. 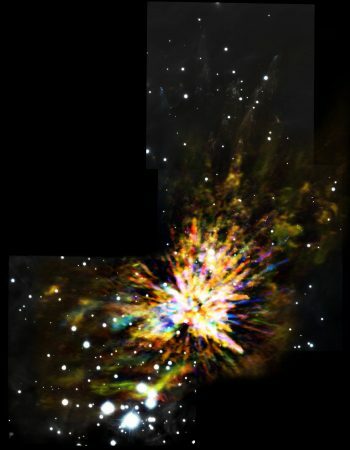 Credit: ALMA (ESO/NAOJ/NRAO), Imanishi et al. 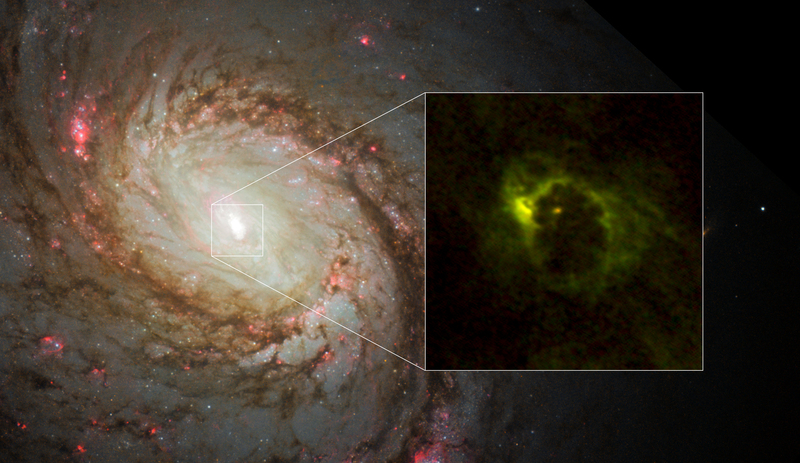 Motion of gas around the supermassive black hole in the center of M77. The gas moving toward us is shown in blue and that moving away from us is in red. The gas’s rotation is centered around the black hole. 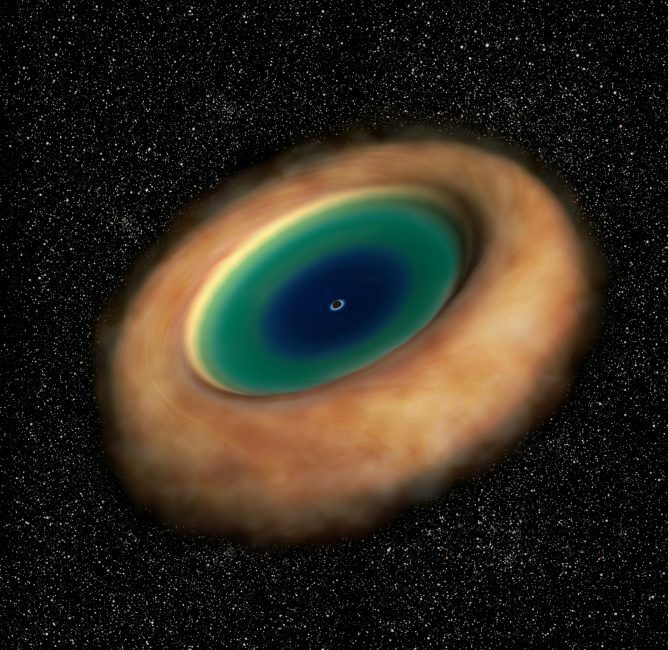 Artist’s impression of the dusty gaseous torus around an active supermassive black hole. ALMA revealed the rotation of the torus very clearly for the first time. Many astronomers have observed the center of M77 before, but never has the rotation of the gas donut around the black hole been seen so clearly. 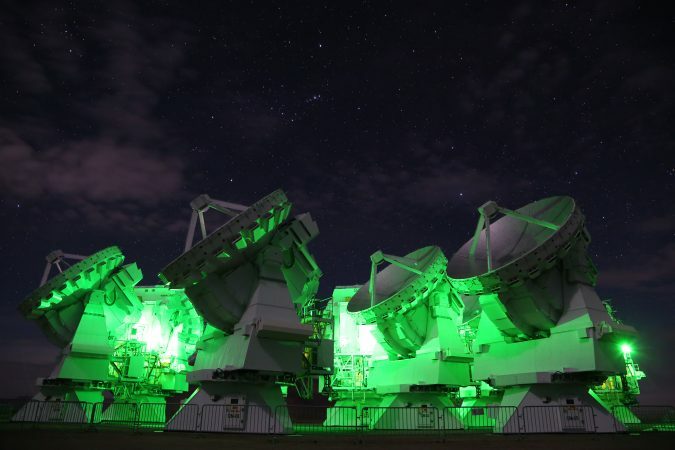 Besides the superior resolution of ALMA, the selection of molecular emission lines to observe was key to revealing the structure. 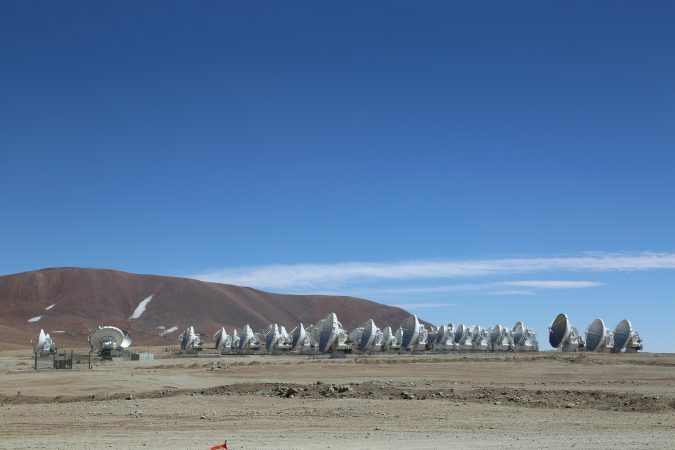 The team observed specific microwave emission from hydrogen cyanide molecules (HCN) and formyl ions (HCO+). These molecules emit microwaves only in dense gas, whereas the more frequently observed carbon monoxide (CO) emits microwaves under a variety of conditions  García-Burillo et al. (2016) observed the distribution and motion of CO with ALMA and did not find clear rotation along the east-west torus direction. Their interpretation is that the turbulent motion is so intense that the east-west oriented rotating motion is not clear. Gallimore et al. (2016) also observed CO emission and found gas motion in the north-south direction. They interpret this as outflowing gas from the black hole.. 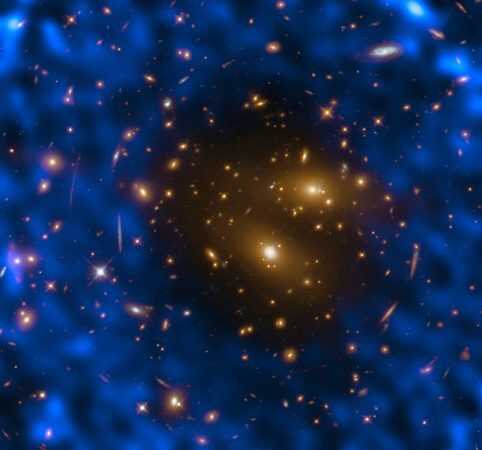 The torus around the AGN is assumed to be very dense, and the team’s strategy was right on the mark. Interestingly, the distribution of gas around the supermassive black hole is much more complicated than what a simple unified model suggests. The torus seems to have an asymmetry and the rotation is not just following the gravity of the black hole but also contains highly random motion. 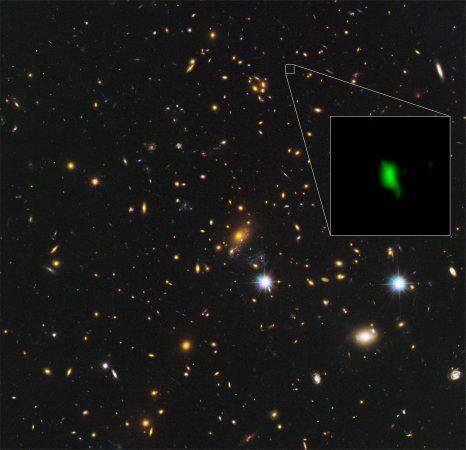 These facts could indicate the AGN had a violent history, possibly including a merger with a small galaxy  Recently, astronomers used the Subaru Telescope to observe M77 and revealed signatures of a merger with a small galaxy billions of years ago. 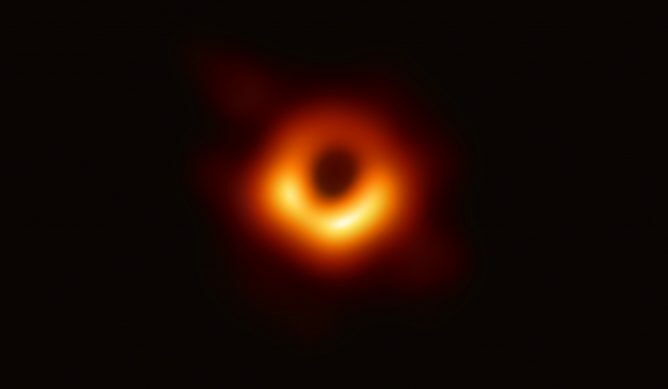 For details, please read the press release “Minor Merger Kicks Supermassive Black Hole into High Gear” issued in October 2017 from the Subaru Telescope.. Nevertheless, the identification of the rotating torus is an important step. These observation results were published as Imanishi et al. 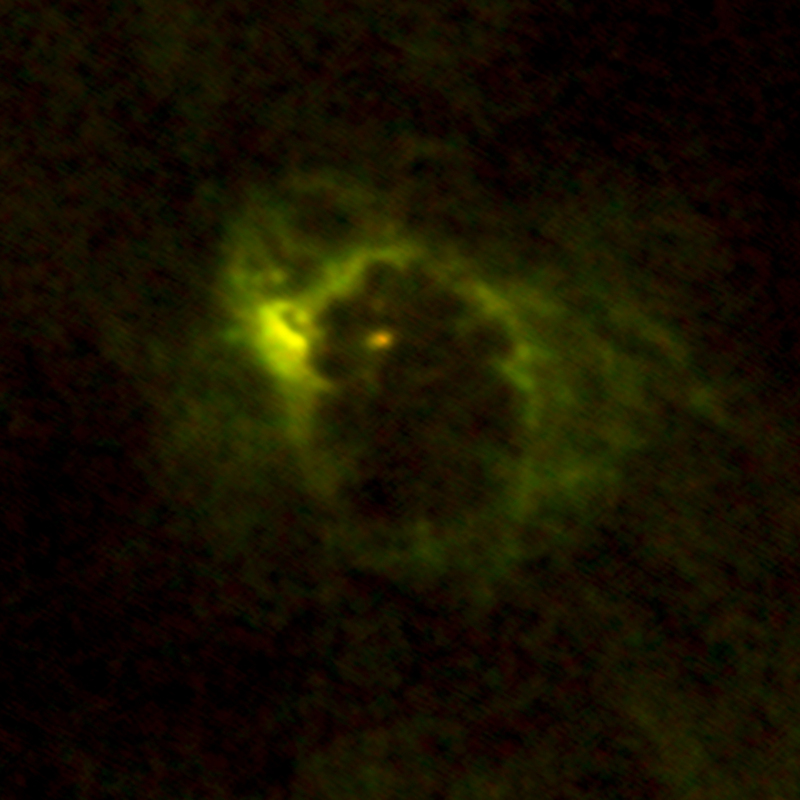 “ALMA Reveals an Inhomogeneous Compact Rotating Dense Molecular Torus at the NGC 1068 Nucleus” in the Astrophysical Journal Letters (2018 February 1 issue, 853, L25). This research was supported by the Japan Society for the Promotion of Science KAKENHI (Grant Numbers 15K05030 and 16H03959). 1. ↑ García-Burillo et al. (2016) observed the distribution and motion of CO with ALMA and did not find clear rotation along the east-west torus direction. Their interpretation is that the turbulent motion is so intense that the east-west oriented rotating motion is not clear. Gallimore et al. (2016) also observed CO emission and found gas motion in the north-south direction. They interpret this as outflowing gas from the black hole. 2. 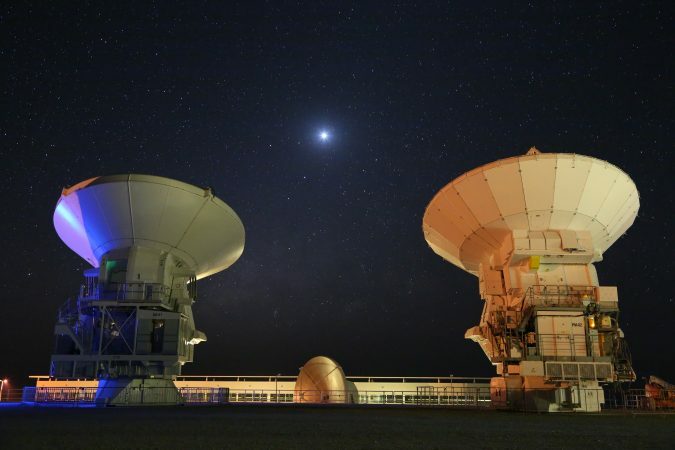 ↑ Recently, astronomers used the Subaru Telescope to observe M77 and revealed signatures of a merger with a small galaxy billions of years ago. 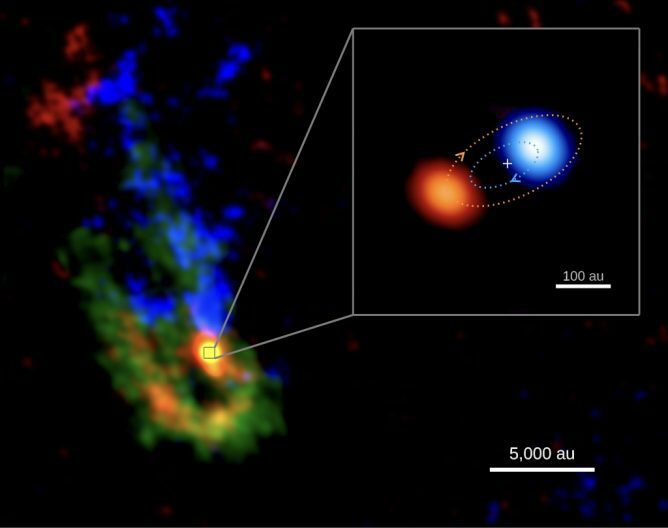 For details, please read the press release “Minor Merger Kicks Supermassive Black Hole into High Gear” issued in October 2017 from the Subaru Telescope.